We’ve got a regulatory requirement that is now taking an EMR implementation and really shoehorning it into a position that isn’t always productive for the physician. That’s tough. They aren’t all analogous. They’re not all apples to apples when you talk about either an analytical platform or a private HIE. There’s going to be a tremendous amount of additional investment as a result of really trying to manage under the margin. You try to stay the course. You try to stay true to the strategy, but you understand — and it’s tough with big system investments — that you’ve got to have some measures of nimbleness so that you can react. As much as I loved where I was and was continually learning and contributing, this really pulled me out of my comfort zone and it made much more crisp a lot of the skills that I had been resting on. Gamble: Right, just as far as people who were understood on a more general level why they needed to attest for it but then once they gets more into the weeds are starting to question everything. Springmann: Yeah. And a lot of the EMRs have a very prescriptive way that you must do something in order to meet the measure, and that very prescriptive way may not be physician intuitive. It might not be in support of a clinical workflow that’s effective. And so we’ve got a regulatory requirement that is now taking an EMR implementation and really shoehorning it into a position that isn’t always productive for the physician. That’s tough. And until we work through these first-generation physician phasing systems, as long as that may take — and they’re smart people. They get very frustrated when they’re asked to do stupid things. And sometimes, to meet those specific measures the specific way any given EMR asked you to do it is just not intuitive, and it’s very frustrating for them. Gamble: It’s already something that can interfere with workflow, and when it’s doing something that think doesn’t makes sense, that’s really going to hurt usage and adoption. Springmann: I’m trying to think if there’s anything else. Certainly, it will be interesting to see how things play out here in the state. We’re all, I’m sure, very aggressively starting to talk much more about population health IS tools. As you know, they are all across the board in terms of levels of sophistication, depth of user base. They aren’t all analogous. They’re not all apples to apples when you talk about either an analytical platform or a private HIE. There’s going to be a tremendous amount of additional investment as a result of really trying to manage under the margin, so to speak. Gamble: Are you part of an ACO? How does that work for you guys? Springmann: We’re not. We have had conversations, and there is some discussion about some of our primary care group going down that path with a couple of the payers. But at this point, in terms of our population health position, I would have to say when you think of attribution, the attribution for us now, based on the new regulation, seems to be geographic, because largely folks who are near you come to you. Our population health model is going to be the one that the waiver imposes upon us. But any other discussions — and our organization has been having discussions with other organizations in the state for this purpose — none of it is mature enough that they’re in the contracting process yet. Gamble: It seems like you almost have your own ACO that you guys have created, just not an official designated ACO. Springmann: Right, and the payment isn’t for a life, because as I said, everyone else is getting paid the same as they did last year — home health, the physicians, the nursing homes. It’s only the hospitals who have had this governor put down on them. Whereas in an ACO, they say, okay, here are 20,000 people, all of you take care of them — ‘you’ meaning all the partners in your ACO. And depending on how you do quality-wise, we’ll give you some additional incentives aside from the per-member, per-month fee we’re going to give you. It’s really a head scratcher. Springmann: I know. Trying to navigate having a conversation about ACO tools and quality reporting — quality reporting for diabetics or obesity or asthma all makes good sense. It may be something that an ACO you might become a part of or whatever payer would be expecting you to do measurements against. That may have nothing to do with what the state will require of us in terms of our quality measures. We know some of them will be the same, like readmissions and present on admission indicators and things like that, but some of them could be vastly different. Your call is as good as mine. We’re all wading through this very interesting experiment. Hopefully, we’ll learn a ton and be able to either take what we’ve learned and help others… or not. I think — and this is just my guess; this isn’t really anything ultimate — if I were to say where the state was going with this, I wouldn’t be surprised if there was geographical attribution. In Medicare, these 10,000 people are attributed to certain primary care doctors, and because of that, the rest of you are part of the contract to take care of those people, but the attribution is with your PCP. In this model, I could see it being geographic where you’re responsible for all these different zip codes and the relationship is between the hospital and the resident of that zip code. Very different. That may not be where it goes and they may not have that clear a crystal ball. What they absolutely know is that we have got to get our Medicare expense down. Gamble: That’s something where just dealing with all the regulatory issues in the state, especially right now, certainly takes a good portion of your time. And when you are in the waiting phase, that’s got to be a tough thing, because you have some plans that I’m sure are on hold or in limbo until things are passed down. Springmann: You got it. You try to stay the course. You try to stay true to the strategy, but you understand — and it’s tough with big system investments — that you’ve got to have some measures of nimbleness so that you can react. Gamble: You said you’ve been there about a year or so, or 15 months? Springmann: I came here at the very end of November of 2012. So that’s That’s about 15 months, 16 months. Gamble: And before then you were at Greater Baltimore. Springmann: I was. I was at GBMC. Gamble: You were there for a while? Gamble: In today’s healthcare world that’s a really long time. Gamble: When you made the move, I can imagine that it was a big transition being the new CIO and being at a new organization. Did you find that it was challenging to take on that role and get to know a whole new staff of people and a new system? Springmann: I found it really energizing and exciting. As much as I loved where I was and was continually learning and contributing, this really pulled me out of my comfort zone and it made much more crisp a lot of the skills that I had been resting on, so to speak. I do think that it’s a very interesting challenge because you go from an organization where you’ve got, I don’t want to say de facto credibility, but folks knew my number. They knew how I operated. They knew who I was; that I said what I did and I did what I said. I had a different personal confidence and professional confidence because I was a known entity and I had credibility that had developed over time. A lot of people in a lot of health systems that aren’t management or executive leadership are very tenured. It’s nothing to find employees in these health systems that have been here 20, 30, and even 40 years, and so part of the moving over was I don’t want to say a crisis of confidence, but you realize thatit’s groundhog day and you’re having to prove yourself all over again. It’s kind of exciting and it’s kind of scary and it’s kind of infuriating.People will challenge you in ways that no one would have ever dreamed of doing that in an organization where for years and years, you were the go-to on certain issues. So it keeps you sharp, and it’s just been phenomenal. This is a very different and interesting culture. It’s a wonderful group of people, and just the differences have allowed me to continue to stretch my leadership skills, which really was the intent of this whole thing. It was a little harder than I thought, though. The whole credibility thing was hard. Springmann: ‘Because I said so’ doesn’t work. Gamble: Sure. And I imagine you don’t want to go in right away and say okay, this is my way. This is the way we’re going to do things.’ But at the same time you have to kind of establish that you are a leader. I can imagine that’s a tough thing to navigate. Springmann: My observation is that folks make a very intentional decision on how they want to make their splash. Some folks come in and say, ‘I’m making all these changes,’ and ‘we’re going to put in this system and we’re going to be structured this way, because that’s what I’ve done before.’ They’ve got their 90-day plan and they go ripping through it. Certainly, that’s one position you can take, and I think if you land on an organization where there is enough ambiguity, lack of process, and need for change, that’s highly relevant. On the other hand, that was not the case when I came here. 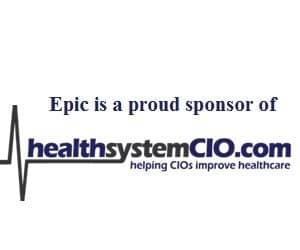 I came in to an EMRAM Level 6 set of hospitals; a very tenured, stable, bright IT team; and an organization whose executive leadership was going through quite a bit of transition due to a number of retirements. My personal choice was to listen and learn and develop credibility through relationships and through demonstration of efficacy and effectiveness in day-in, day-out decision making. I think that’s a little harder and it takes longer. It’s not as splashy, but in this organization, that was the right thing.The easy thing would have been to say, ‘we’re going to go rip this out, rip that in, give me hundred million bucks and I’m going to put the organization on its ear.’ But it was clear to me that that would have been extremely disruptive to the organizational successes they had already had. So there’s been a lot of evolution, but it’s been more like water over a rock than a hammer. Gamble: Sometimes people don’t respond well to the hammer. They might do it because they have to, but you could get resentment or a lack of trust. Springmann: Back to that credibility thing, some people do use fear as a motivator. I’m just not one of those people. Someone can feel fearful if they know my bar is high and their performance isn’t what it should be, but not fear for fear itself; fear that the carpet is going to be ripped out from under them. But that does put a new leader in a level playing field, because they’re stomping their foot down saying look, ‘I’m not comfortable and I’m in an uncomfortable place, so I’m going to put everyone else there too.’ Again, if this were a turnaround situation I can see where that would be valuable, but it wasn’t.